With new business startups flush with millennials cropping up every day, the company softball or bowling team of the past might need to be rethought. Sure, there are trendy new sports like Kickball or Bocce or Dodgeball to get everyone excited about, but before you even worry about locations and times, who is going to play second base, or how this could fit into your company’s corporate wellness program, let's run through 8 big reasons from our friends at FunCorp why you should sign up a company sports team for the office. 1. FUN is a vital investment that will show up in the bottom line. Don't take our word for it ... it’s just science. Study after study has shown that when employees are deciding whether or not they work for a “great company” or whether they should recommend an open position to a friend, the concept of “having fun in the workplace” is a key factor. Your business can lose employees for a host of reasons, but a lack of Fun shouldn’t be one of them. Facilitating fun activities and social connections between your employees will ultimately create a culture of Fun that can help you retain great employees longer. 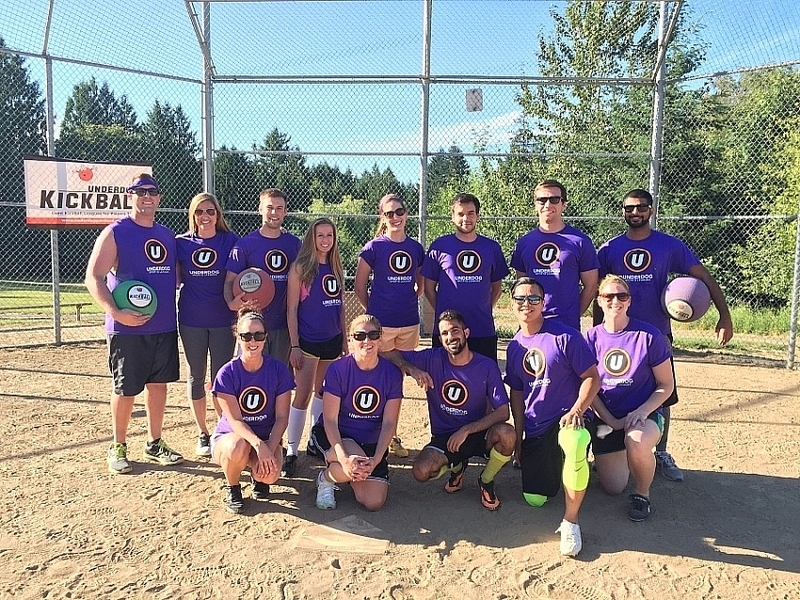 Would someone stay at your organization for less money if you invested in a seasonal company Kickball team? And how much money would that save you in recruiting and re-training costs down the road? 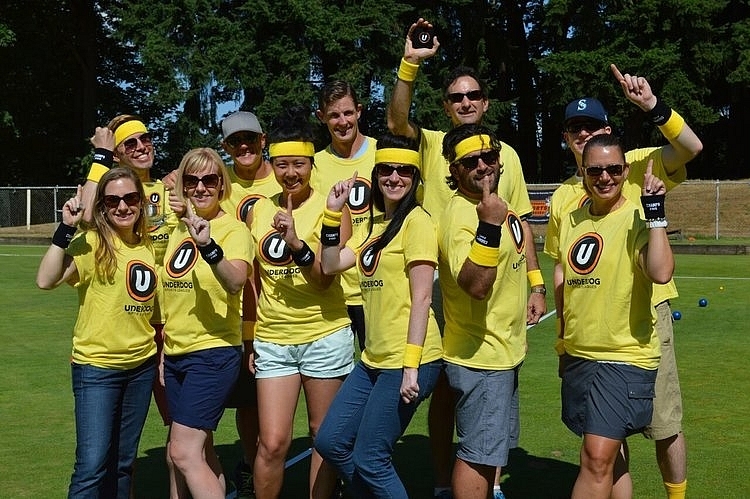 Encouraging a company sports team goes a long way towards developing a FUN company culture, and paying for some or all of the team is even better. It not only shows you are willing to invest in happiness for your employees, but it also shows you are willing to invest in experiences. Sure you can buy the company a ping pong table for the lunchroom, pay for a gym membership, or even give profit-sharing bonuses. But profit-sharing is an individual reward, people normally go to the gym by themselves, and people play ping pong with one other person. How about 12-15 potential new friends on a company Softball or Flag Football team every week instead? Face it, no matter how “open” your office is or how much you have tried to create social collisions by moving around the snacks or the coffee machine, your company has cliques just as sure as it has departments and an org chart. Whether people work on different floors, in different buildings, or even work remotely in and out of the home office, a sports team offers an opportunity to break some of the silos that naturally form in any business. You know that having people from different departments talk about ideas and challenges will always be a net positive, so does it matter if it happens in the office or when they are carpooling on the way to the volleyball court? Is your business so big that one sports team isn’t enough? You're awesome! Why not set up a private league for your company instead and mix and match employees from different departments and buildings? 4. Create great recruiting assets. One often-overlooked perk of creating company sports teams or planning one-day events is that you are easily creating valuable company assets for your internal social media channels and for recruiting. You could pay an outside firm thousands of dollars to take some gimmicky photos for a glossy brochure…But most sports leagues include taking team pictures and champs pictures, passing out great colored shirts, and sometimes even shooting video. So let a sports league create recruiting assets for you, assets that show your company encourages and values Fun. Sometimes the best part of the vacation is not even the time away, but the weeks beforehand looking at that date on the calendar and knowing it is approaching. A company can use the same technique, whether hosting a Lunch Time league or a company sports team. If you know that Fridays are great but Mondays are always a drag, try signing up for a Monday Kickball or Volleyball league so employees have something positive to look forward to all day long! According Ron Friedman PhD, an award-winning psychologist who specializes in human motivation, happy hours and cocktail parties are better than nothing, but they place all the pressure on social interaction and conversation, which for some people [see also introverts and nerds] is a tall order. The beauty of a company team is that the activity becomes the focus and the social interactions and connections will come more naturally, especially to people who might not be the best at socializing. Even better, many leagues offer deals and prizes at the sponsor bar after the game, so you get your happy hour and activity all in the same night. Getting people out to the game isn't just fun, it also means that you are creating connections outside of the workplace, which will pay long-term dividends. Does an employee’s friend show up to watch the game? Does their spouse or even their kids come to watch the last inning? All of these interactions in a fun setting will help your employees become more engaged and connected, no matter what the score of the game is. One of the biggest reasons employee engagement suffers is people don't feel like they are part of the team, so why not literally make them part of a sports team and see if this different approach boosts morale in the office? 8. Heck ... just get your name out with some easy PR and low-intensity networking! Start where it’s easy. Instead of spending thousands of dollars on advertising, PR, and marketing campaigns, just name your company sports team after your new startup. If Zizzle is your hot new app product launch, name your company kickball team the Zizzle Zazzlers. Everyone you play against will ask you what your team name means, and you have an automatic intro. Your brand will also be on the website and every schedule page for the league. Deck out your team in your company-branded gear and cool uniforms. Who knows, the next b2b client you are looking for may also have a team in the league. If they are playing across the field from you, some casual chatter in the batter’s box or after the game could make that team registration fee the best marketing dollars of the year. There are many more advantages to company teams, including the obvious benefits of exercise and team-building outside of the office. Many companies approach us after first having tried it themselves, but you have a business to run! 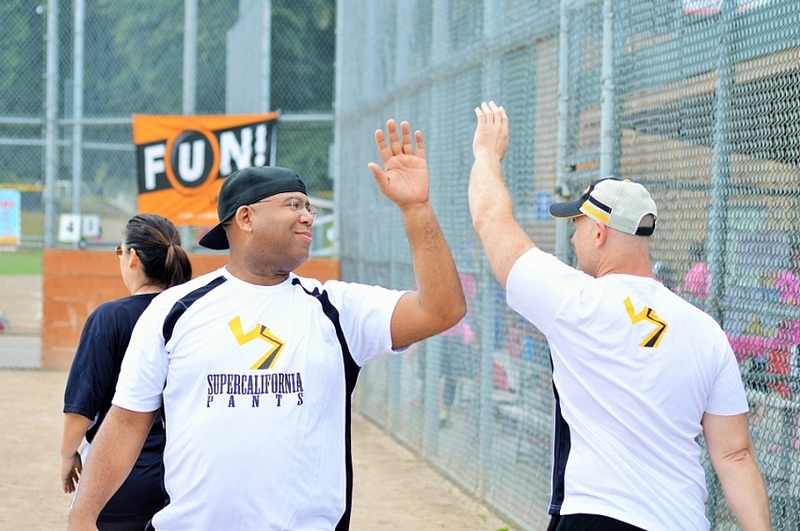 Instead of trying to cobble together fields and umps and gear and rules, leave that to a Social Sports League in your area and instead focus on using the team to create new social connections and a culture of fun.